Over the weekend, Camp Director Max Bass and I were invited to an event at Dowagiac Conservation Club. 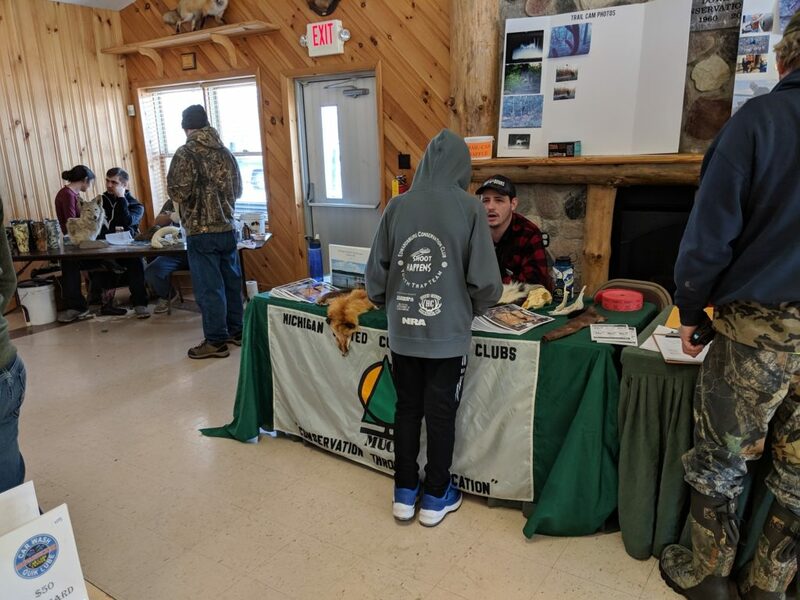 Dowagiac is an MUCC affiliated club and they were hosting their 22nd annual Hunter’s Rendezvous. This event is a chance for club members and the public to get together after the hunting season to reconnect and share stories from the field and holidays. It is also highly focused on connecting the youth to the outdoors and there were several kid-friendly activities taking place. Max and I were operating a booth filled with Michigan mammal pelts. We were teaching both kids and parents about common Michigan wildlife and their habits. While we had them at the booth, we also had plenty of camp brochures to hand out. As a club, Dowagiac is planning to send seven kids to the Michigan Out-of-doors Youth Camp this year. Therefore, this was a great chance for parents to ask questions about camp and meet Max since he is new. Next, to our booth, a taxidermist was working on a mink mount and showing people the work that goes into his special art. There was a wood-burning station where kids could try their hand at making animal designs on coaster size blocks of wood. Around the corner from the wood-burning station was the Hunter Education laser shot system. Instructors here were teaching kids proper firearm safety while allowing them to go on a simulated hunt. The loudest booth was a National Wild Turkey Federation. They were giving turkey-calling lessons and they even hosted a turkey calling competition for the kids. About 15 kids participated in the calling contest and about 12 of them were better callers than I am. This was a fun club event to be a part of and Max and I were happy to take a break from the Huntin Time Expo to visit an affiliate club.